To borrow a phrase (and an image) from my first campaign, four years ago. It’s Time. It’s time to vote. It’s time to choose experience. It’s time to put partisan politics aside and cast your ballot based on facts. Every vote counts. 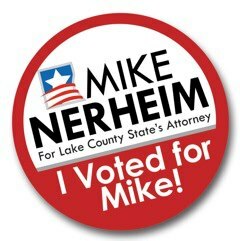 Please allow me to share with you my message to the voters of Lake County, who I am counting on to make the choice to vote to allow me to continue to seek justice on behalf of all of the citizens of our great county.